My wife’s blog on her ecommerce site has been picking up a lot of steam recently. She is starting to get the majority of her traffic from long tail searches to the blog. These random searches are unearthing blog posts some from over a year ago. This is one of the core principles that I cover in our starter kit on building your online store. I have devoted an entire book to blogging for your online store. 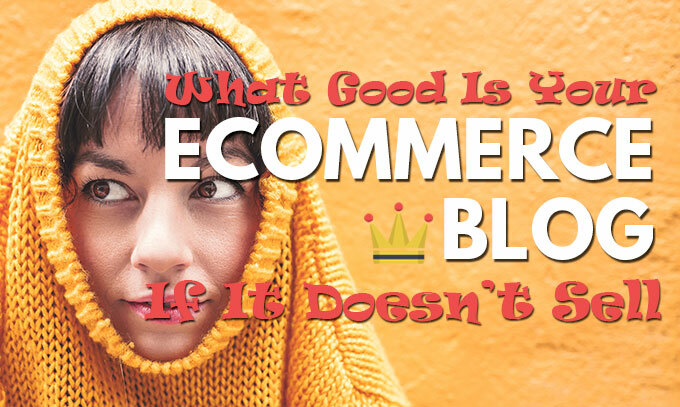 There are tons of reasons for creating a blog for your ecommerce site. The most important is the traffic. So this week, as I looked at her Google Analytics data, I realized I could do better. While I had thousands of people coming to the blog and getting familiar with the brand, they weren’t digging deep enough. Most of these visitors came and read 1 or maybe 2 articles. They wouldn’t click through to the store and shop for jewelry. This is my fault though. While I make it a point to focus on the SEO techniques of the posts, I have been neglecting the deep product linking. 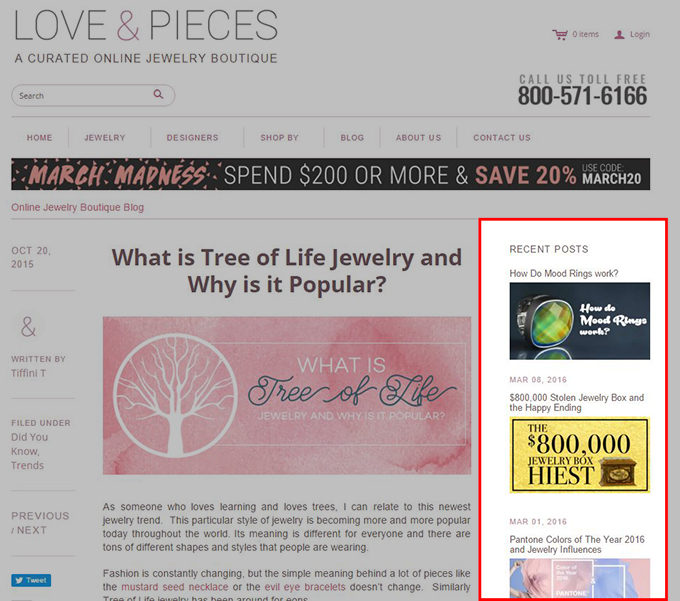 When we publish a post on any ecommerce blog, I like to have at least 2 links within each blog post to products, collections, or other blog articles on the site. While I do this, I haven’t focused enough on having the writers (we outsource our blogging) weave in product placement into the posts. This is tough to do. The writers don’t know much about your inventory. For us to hold their hand in each post, is too time consuming. I knew there was a better way to get people into the store. I looked over my wifes blog layout and decided it needed a change. Below is how the layout was before the change. If you notice, the top right part is completely focused on other blog posts. This is prominent placement and I’m wasting it on other blog posts. If I couldn’t get people to the products, I would bring the products to them. On the home page of her site, she has a section which features her favorite jewelry pieces. These are popular pieces, coupled with ones that she loves. I decided I would incorporate this in the blog right column. 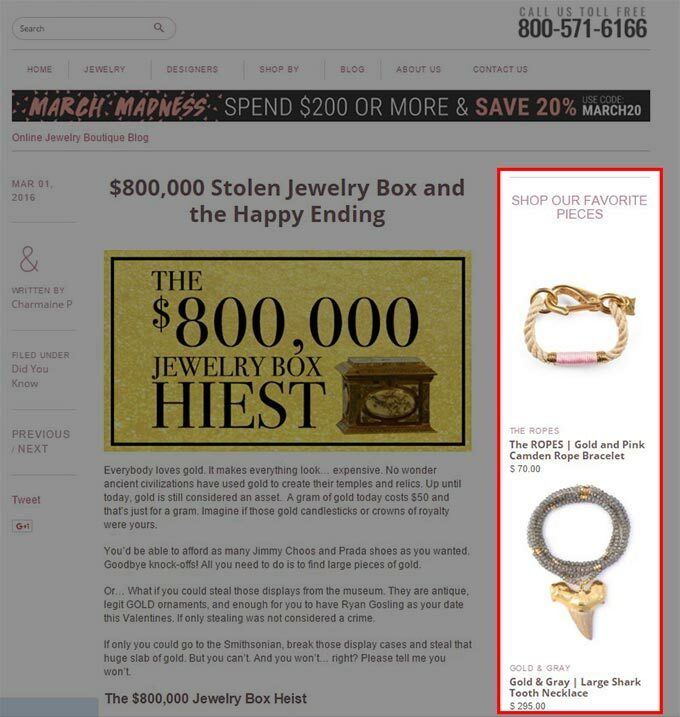 Random Fact: Google Shopping Feed won’t allow shark teeth jewelry even if its fake. They don’t do animal parts. With a few changes in the template of the Shopify theme, I was able to insert this collection in prime real estate. Below is what it looks like now. HINT: I had to change this on both the blog template and the individual article template. They are different views. So with a little studying of the data and thinking outside of the box, I believe I have increased her product exposure greatly. While its too soon to know for sure whether this is going to affect the bottom line, I think its a no brainer. It’s the same reason that amusement parks or the Zoo make you exit through the gift shop. So my homework to you is simple. If you aren’t weaving product placement into your blog posts, you need to be doing this immediately. Secondly, if you are getting traction with your blog, put your product in their face. It’s much harder to sell something if people can’t see it.